قلعه‌نویی, سمیرا, ابراهیم‌زاده اردستانی, وحید. (777). برآورد عمق، ضریب دامنه و فاکتور شکل هندسی کانسار باریت با استفاده از وارون‌سازی غیرخطی نامقید داده‌‌‌های گرانی‌سنجی. مجله ژئوفیزیک ایران, 9(3), 60-75. سمیرا قلعه‌نویی; وحید ابراهیم‌زاده اردستانی. "برآورد عمق، ضریب دامنه و فاکتور شکل هندسی کانسار باریت با استفاده از وارون‌سازی غیرخطی نامقید داده‌‌‌های گرانی‌سنجی". مجله ژئوفیزیک ایران, 9, 3, 777, 60-75. قلعه‌نویی, سمیرا, ابراهیم‌زاده اردستانی, وحید. (777). 'برآورد عمق، ضریب دامنه و فاکتور شکل هندسی کانسار باریت با استفاده از وارون‌سازی غیرخطی نامقید داده‌‌‌های گرانی‌سنجی', مجله ژئوفیزیک ایران, 9(3), pp. 60-75. قلعه‌نویی, سمیرا, ابراهیم‌زاده اردستانی, وحید. برآورد عمق، ضریب دامنه و فاکتور شکل هندسی کانسار باریت با استفاده از وارون‌سازی غیرخطی نامقید داده‌‌‌های گرانی‌سنجی. 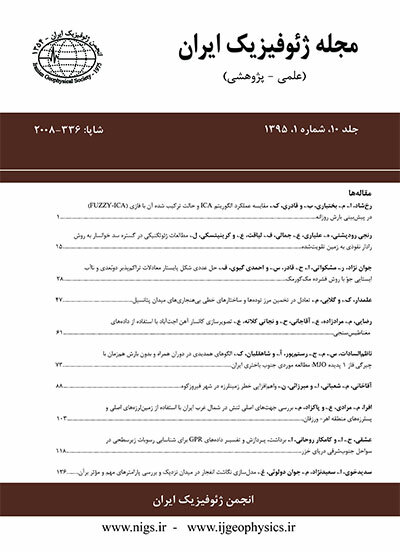 مجله ژئوفیزیک ایران, 777; 9(3): 60-75. یکی از مهم‌ترین مسائل ژئوفیزیک، برآورد پارامترهای ژئوفیزیکی ساختار مدفون است که با استفاده از برگردان بی‌هنجاری گرانی بازماند یا مشاهده‌‌ای صورت می‌‌گیرد. از جمله این پارامترها می‌توان به عمق ، ضریب دامنه و فاکتور شکل هندسی اشاره کرد. در این مقاله روش جدیدی برمبنای مدل‌سازی وارون غیرخطی نامقیدبرای برآورد عمق، ضریب دامنه و فاکتور شکل یک ساختار مدفون، با توجه به بی‌هنجاری گرانی مشاهده شده ( ترکیبی از بی‌هنجاری منطقه‌‌ای و ‌مانده) مربوط به کره، استوانه افقی و قائم مطرح شده است. ابتدا با استفاده از مدل‌‌‌های مصنوعی دقت و صحت روش پیشنهادی بررسی و پس از تأیید روش، از آن برای برآورد پارامترهای ژئوفیزیکی مورد‌نیاز برای اکتشاف کانسار باریت در منطقه آباده استفاده شده است که نتایج حاصل با نتایج مربوط به حفاری و سایر روش‌‌‌های ژئوفیزیکی از جمله روش تفسیری اویلر هم‌خوانی و تطابق قابل‌توجهی داشته است. One of the most important exploration problems in geophysics is to estimate the geophysical parameters from the observed or residual gravity anomaly related to a buried structure, such as depth, amplitude coefficient and geometrical shape factor. The gravity anomaly expression produced by a simple geometrically shaped model (sphere orcylinder) can be represented by an appropriate analytical formula. Several interpretative methods have been developed to interpret gravity field data assuming a fixed simple geometrical model such as a sphere, a horizontal cylinder or a vertical cylinder. In most cases, these methods consider the geometrical shape factor of the buried body to be apriori assumed, and the depth variable may thereafter be obtained by graphical methods applied to the residual anomaly. However, only a few methods have been developed to determine the shape of the buried structure from the residual gravity anomaly. Consequently, the accuracy of the results obtained by these methods depends on the accuracy within which the residual anomaly can be separated from the observed gravity anomaly. In this study, a new and simple method has been developed to estimate the depth, amplitude coefficient and geometrical shape factor of a buried structure from the observed (composite) or residual gravity anomaly related to a cylinder or sphere-like structure. The method is based on nonlinearly constrained mathematical modeling and also stochastic optimization approaches. This method consists of three main steps: The first step is oriented to formulate a nonlinearly constrained optimization model (NCOM) which mathematically describes the geophysical gravity problem related to the studied structure. The (NCOM) model is to optimize a mathematical objective function on an unbounded subset (defined by mathematical inequalities constrains in which the geophysical parameters are generally surmised to satisfy) contained in the free geophysical parameters. Ignoring these mathematical constrains probably leads to general error estimations of the parameters. In this research, the objective function was taken as the statistical likelihood function which depends on the deviations between the observed and synthetic points and also on the number of observations. The second step is directed to suggest an interior penalty function to transform the (NCOM) model into a nonlinearly unconstrained optimization one (NUOM). The goal of using the penalty function is to eliminate the constraints of the (NCOM) model and make them reactive in a new target function of the (NUOM) model[E1]Â . The target function of the (NUOM) model considers both the objective function of the (NCOM) model and the suggested interior penalty function. The third step is to solve the (NUOM) model by the adaptive simulated annealing algorithm, a stochastic approach, well-known for optimizing numerical functions of several real decision variables. The obtained solution of the (NUOM) model includes the geophysical gravity parameters of the studied structure such as: depth, amplitude coefficient and shape factor. A statistical analysis has been carried out to demonstrate the accuracy and the precision of the suggested interpretative method. We applied this method to some theoretical synthetic examples in order to evaluate the precision of the suggested method. We also used the method to estimate the mentioned parameters for the gravity anomaly of the Abadeh site. The obtained results had an appropriate agreement with other methods. ABDELRAHMAN, E.M. and SHARAFELDIN, S.M. (1995a), A Least-squares Minimization Approach to Depth Determination from Numerical Horizontal Gravity Gradients, Geophysics 60, 1259–1260. ABDELRAHMAN, E.M. and SHARAFELDIN, S.M. (1995b), A Least-squares Minimization Approach to Shape Determination from Gravity Data, Geophysics 60, 589–590. ABDELRAHMAN, E.M., BAYOUMI, A.I. and EL-ARABY, H.M. (1991), A Least-squares Minimization Approach to Invert Gravity Data, Geophysics 56, 115–118. ABDELRAHMAN, E.M., EL-ARABY, T.M., EL-ARABY, H.M. and ABO-EZZ, E.R. (2001a), Three Least squares Minimization Approaches to Depth, Shape, and Amplitude Coefficient Determination from Gravity Data, Geophysics 66, 1105–1109. ABDELRAHMAN, E.M., EL-ARABY, T.M., EL-ARABY, H.M. and ABO-EZZ, E.R. (2001b), A New Method for Shape and Depth Determinations from Gravity Data, Geophysics 66, 1774–1780. ASFAHANI, J. and TLAS, M. (2004), Nonlinearly Constrained Optimization Theory to Interpret Magnetic Anomalies due to Vertical Faults and Thin Dikes, Pure Appl. Geophys. 161, 203–219. GUPTA, O.P. (1983), A Least-squares Approach to Depth Determination from Gravity Data, Geophys. 48, 375–360. Ingber, L. (1993a) Adaptive Simulated Annealing (ASA). Global optimization C-code. Caltech Alumni Association. Ingber, L. (1993b) Simulated annealing: Practice versus theory. Mathematical Computer Modelling. 18(11), 29-57. INGBER, L. (1996), Adaptive Simulated Annealing (ASA): Lessons Learned, J. Control and Cybernetics 25, 33–54. INGBER, L. (2011), Adaptive Simulated Annealing (ASA): Lessons Learned, J. Control and Cybernetics 25, 33–54. Johnson, D. C., Aragon, C. R., McGeoch, L.A., &Schevon, C., (1987) Optimization by simulated annealing. An experimental evolution (part 1 & 2). Report AT& T Bell laboratories. Kirkpatrick. A.C, Gelatt C.D., and Vecchi M.P., Optimization by simulated annealing, Science 220 (4598), 671-680 (1983). MOHAN, N.L., ANANDABABU, L. and ROA, S. (1986), Gravity Interpretation Using the Melin Transform, Geophys. 51, 114–122. Nettleton, L. L., 1976. Gravity and Magnetic in oil prospecting, MacGraw-Hill Book Co.
ODEGARD, M.E. and BERG, J. W. (1965), Gravity Interpretation Using the Fourier Integral, Geophys. 30, 424–438. SHAW, R.K. and AGARWAL, S.N.P. (1990), The application of Walsh transform to Interpret Gravity Anomalies due to Some Simple Geometrically Shaped Ceased Sources: A Feasibility Study, Geophys., 55, 843–850.